David is the super buff guy who hangs out at the sand box. Which one? You might ask, as that description ﬁts many a local. Well, David is the guys that pulls back ﬂips of off the 12 foot bleacher, landing in the sand next to the balance beam. David has been a ﬁxture in the Muscle Beach Park for well over a decade, so today we are going to get to know him and what his favorite thing in Venice are. Name, Occupation: David Frison, Actor. Number of years in Venice? 20 years. I started going to the pit in July 1995! Favorite drink at the bar: Not a bar kind of guy, but I like Chilean Red Wine. Two things we should know about you? As a child growing up, I always had all the support I needed, so I never doubted myself. Today, I have accomplished all the big dreams I had and then some; working with my Idol Sylvester Stallone, being Superman’s body double, etc. So my philosophy would be that adults (and children) have NOTHING to lose by letting children believe. Can you explain to our readers what and where the sandpit is, and what it does offer? Within the Venice Recreation Center, the Sand Pit is located directly between the work out pit and the Ocean. It is in fact an open air area for anybody to enjoy. It offers free basic gymnastics equipment such as parallel bars, high bars, rings, a balance beam etc. Describe what you do at the Sandpit at Muscle Beach Gym in Venice. I use this facility everyday for my work outs as one would in a gym, though I strictly do callisthenic exercises. On weekends, I also put on a bit of an acrobatic/stunt show for my and the tourists pleasure. Favorite gymnastic trick or activity? I certainly enjoy doing tricks that involve high altitude and danger, such as flyaways from the swinging rings or back layouts off of the top of the bleachers and over concrete. What days of the week can we catch you at sand pit? Everyday after 2 pm! Except for Sunday when I practice at another spot. Do you mind if people take photos of you, and do you take tips? Great question! Thank you. I love it when people actually DO ASK me, it is very flattering. But when they silently wait for me to do something (or actually just stand there) and raise their camera to STEAL a shot, I get offended. They truly make me feel like a monkey at the Zoo; objectified and put there for their enjoyment. I feel like the common courtesy would be to ask. As to tips, nah, spend it on the hardworking performers on the boardwalk instead. Are there any other facilities besides Muscle Beach Gym Venice, that offer rings, ropes, bars and sand? Yes, about one mile north, at the Original Muscle Beach in Santa Monica where you’ll find me every Sunday. And of course, I am going to ask, what is your secret for great abs? You make me smile, humbly. It is simple: I eat ONLY healthy food and I make time to work out everyday. I never over train though, I work out 2 muscle groups every four days, so they get time to rest and rebuild. Locals, hippies & tourists’ private beach. What is your perfect day in Venice? My perfect day in Venice, I’m happy to say is actually my TYPICAL day in Venice! And that means a whole lot. Waking up (in Venice, haha), cook and have breakfast. Make my way to the Recreation Center where I spend most of the afternoon doing sports (in the Sand Pit) along with some good friends. Talk to strangers, teach them a new gymnastic trick or two, inspire a child or make a connection with a pretty girl. There are common occasions that make my perfect day even sweeter. If a visitor to Venice had only one day to experience the city, what would you suggest as Venice essentials? Experience not only what Venice is touristically known for, but also have a peek at the locals’ lifestyle, since what really makes/defines a place is its people. So walk inland, two blocks will do, and grab a sandwich at the Windward Farms that you’ll go eat somewhere at the Recreation Center. Along the way, you will see and interact with folks in a manner that is most typical to the Venice lifestyle. What are some interesting or unusual destinations in Venice that even locals might not be aware of? Hidden Venice treasures? The 3 blocks of Nowita, Marco and Amoroso Pl. between Shell Ave. and Lincoln Blvd. 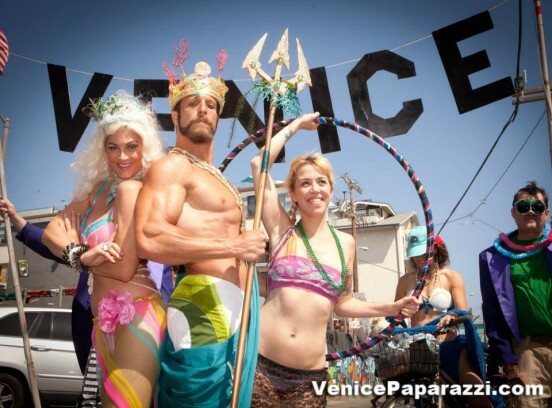 What are a few of your favorite Venice things? The Sand Pit and its gymnastics equipment. Having learned some “crazy” gymnastics tricks. Your favorite boardwalk performer(s): The acrobatic show of Alex and his Islander friends. Because I love my town, I want to protect it. Please don’t smoke in the parks (most folks play sports there). But if you do, at least DON’T drop your butts on the ground!! Don’t treat PEOPLE like objects; if you want to take their picture, AT LEAST ASK THEM. The BIKE path is just that; a path for bikes, NOT pedestrians. Next ArticleWe got the gig! Venice Paparazzi is going to Hollywood!